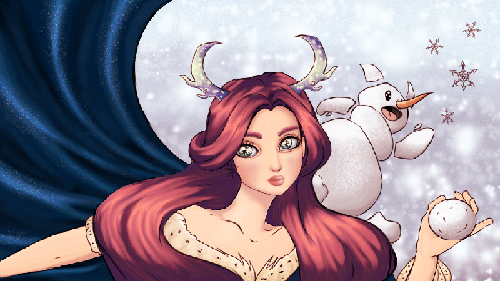 Winter challenge digital art - GLAM! To be honest I have only done about 4 digital art pieces and have always wanted to get more into digital painting to do my sketches but I really felt I was not up to par. I noticed Ryky had a winter seasonal challenge up with this beautiful line art I really loved it and decided to use it as practise . This has taken me all week and countless hours of work and too many layers and the blending arg ! but I am so pleased with it. Tool shading is allot harder than it looks ! I think i spent more time on this than dolls ! Be nice I'm a beginner !